Septic tanks and a subterranean discharge is the single largest way people rural communities treat waste water. That is, in places where the soil, topography and hydrology allow for underground discharge. The other limitation of septic systems is the capacity, if you expect large volumes of water then you need a large tank/multiple tanks and that can be very expensive. I have already written a fair amount about septic systems, and in this article I am going to explore some of the other options for onsite watsewater treatment. Then next two most common options are Lagoons and constructed wetlands. A sewage lagoon is a water-tight earthen berm including the bottom. The construction is not complex, but it can become land intensive depending on the size. Constructed wetlands are identical to lagoons but they are allowed to grow over with vegetation forming a complete wetland ecosystem. 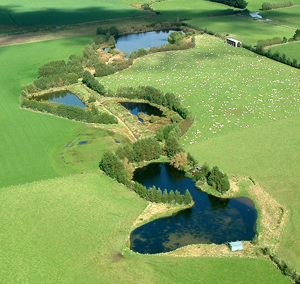 Lagoons are sometimes referred to as stabilization ponds. In a basic level, they reduce organic contamination in domestic sewage down to levels suitable for release back into the environment with minimal impact. If they are operated correctly, they can have a positive effect on the receiving water way. The lagoons I operated have lower phosphate, ammonia and nitrogen levels than the river they discharge into. Lagoons are best constructed with a bulldozer or front end loader because it will be easier to create even depth impermeable layers of soil. The impermeable layers are constructed by compacting clay based soils into a water tight layer. If the available soil is impractical for compaction, a layer of sand topped with a plastic/rubber liner at least 30mm thick. There are professional installers and commercial DIY options available. Below is a table from University of Missouri outlining the size and space a lagoon requires. 1FOR HOMES WITH MORE THAN FIVE BEDROOMS, TANK VOLUME IN GALLONS = (1.5 X DAILY SEWAGE FLOW) + 500. 2ADD 440 SQUARE FEET OF WATER SURFACE AREA FOR EACH ADDITIONAL BEDROOM. 3MINIMUM LAGOON WATER SURFACE AREA IS 900 SQUARE FEET AT THE 3-FOOT OPERATING LEVEL. 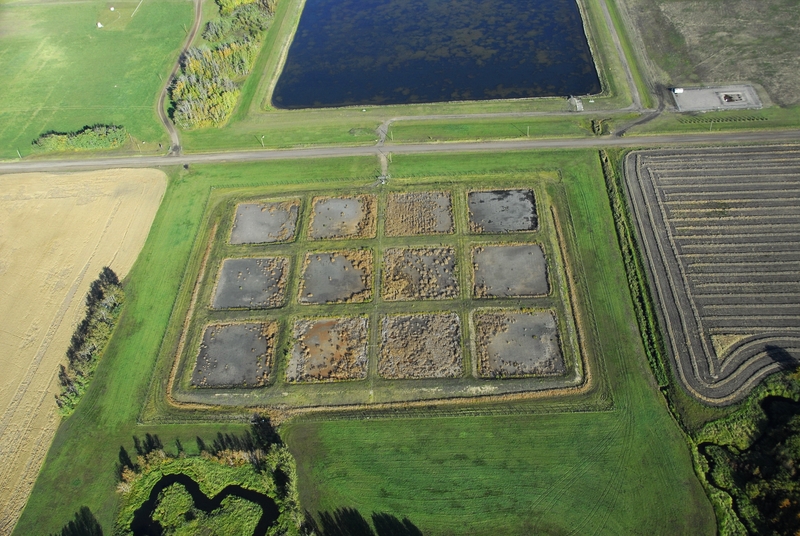 You may be wondering how a lagoon/wetland system can handle larger volumes than a septic system. The answer is oxygen. 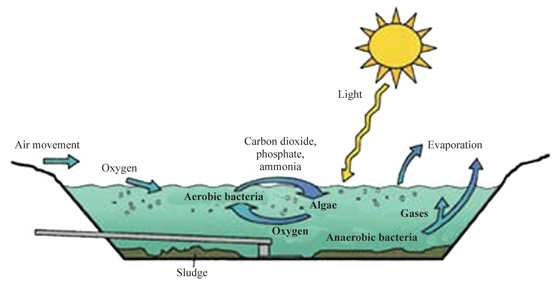 Septic systems operate under anaerobic conditions meaning they are oxygen deprived. Lagoons and wetlands are facultative. Facultative environments are partially aerobic, and partially anaerobic. In a lagoon the surface is aerobic as oxygen from the atmosphere is added to the water and the deeper you go the more anaerobic conditions become. Aerobic conditions allow a much more efficient bacteria to break down the waste. These more efficient bacteria are surprisingly named aerobic bacteria. If a lagoon or wetland is operating properly, there will be a musty smell. This is the same smell produced by natural wetlands, if you have ever been to a swamp you know the smell I am referring to. If the oxygen balance is disrupted, for any reason, either overloading or ice cover or chemical contamination the process will turn septic/anaerobic. Then the lagoon will produce a wide bouquet of odors, most notably a rotten egg smell caused by the formation of hydrogen sulfide. If you have ever opened a septic tank and caught a whiff, that is the smell I am referring to. If you decide to treat your onsite waste this way, maintenance of the oxygen balance is critical to avoid the inferior treatment and smells of anaerobic conditions. Simple things like keeping trees at least 50 feet away from the lagoon will add more oxygen to the water by allowing for more sunlinght (photosysthisis produces oxygen) and wind contact (physically transfers oxygen to the water). In extreme cases pumping water so it circulates to the surface will also add a lot of oxygen, as will pumping air directly into the water via an air compressor and diffuser will almost guarantee you never see anaerobic conditions. Sometimes waste systems are combined and there is a septic tank that feeds into a lagoon or wetland and then into a receiving water system. This arrangement can improve all around wastewater treatment and extend the life of the entire system. If your local regulations and soil conditions allow for these types of waste water treatment they are definitely worth considering. Properly maintained and properly designed they can become an attractive and functional feature to any property. 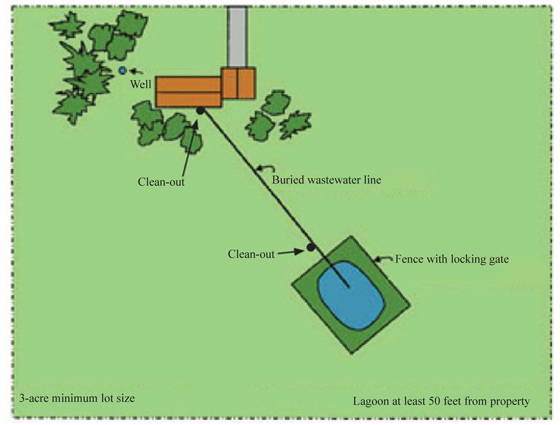 How Big Of A Septic Tank Do I Need? Septic systems are the most common type of sewage treatment for people living off of municipal or communal sewage systems. The treatment of sewage is necessary even for people going “off grid”. Most, and probably all jurisdictions in North America have some requirements for sewage treatment. Treating sewage is also significantly better for the environment as exposure to untreated waste water is a common way to spread disease in humans and other animals. Septic systems break down the organic components in sewage and provide water that is safe to be released into a form of biological treatment. This is usually soil, in the form of a drain field. I frequently get asked how large a septic tank is needed for someone installing or upgrading their waste management system. How large a tank needs to be ultimately depends on how much water will be put through it. Predicting how much water will enter your septic tank will can be simple, or it can be very difficult but it always starts with your water use. To estimate your water usage there are some things you will need to know. How many people are in your household? How many people are usually in your house and on your system? This includes visitors which only visit once a year. How much water are you currently using? If you have a water bill now you can see it easily. The water you use day to day becomes the waste water you have to deal with later. The age of people in your household will play a factor. Even if you are good at conserving water, children will waste a lot more water and they require more water in the form of bathing and laundry. Both of those traits will increase the demand on your septic system when many kids are around. Larger septic tanks are required for people not used to conserving water, when choosing your tank size, try to remember, most people are horrible at conserving water. Ok, here are some guidelines for determining the size of the tank required. The smallest tank size allowed in some jurisdictions is one thousand gallons. A one thousand gallon tank can handle around 600 gallons of sewage per day. In terms of percentages, a septic tank should he 40% larger than the flow of sewage into it, or the sewage flow should not be greater than 60% of the tank capacity. Homeowners are responsible for maintaining their septic systems. It not only protects the investment in your home, but also protects your water supply and those of your neighbors. You don’t want to be the cause of major ground water or surface water contamination because of a malfunctioning septic tank. The liabilities are potentially huge and your homeowners insurance may not cover you if you didn’t do the required maintenance. It will also make selling your home difficult, I personally have walked away from houses I wanted to buy because the septic system was not in proper working order.